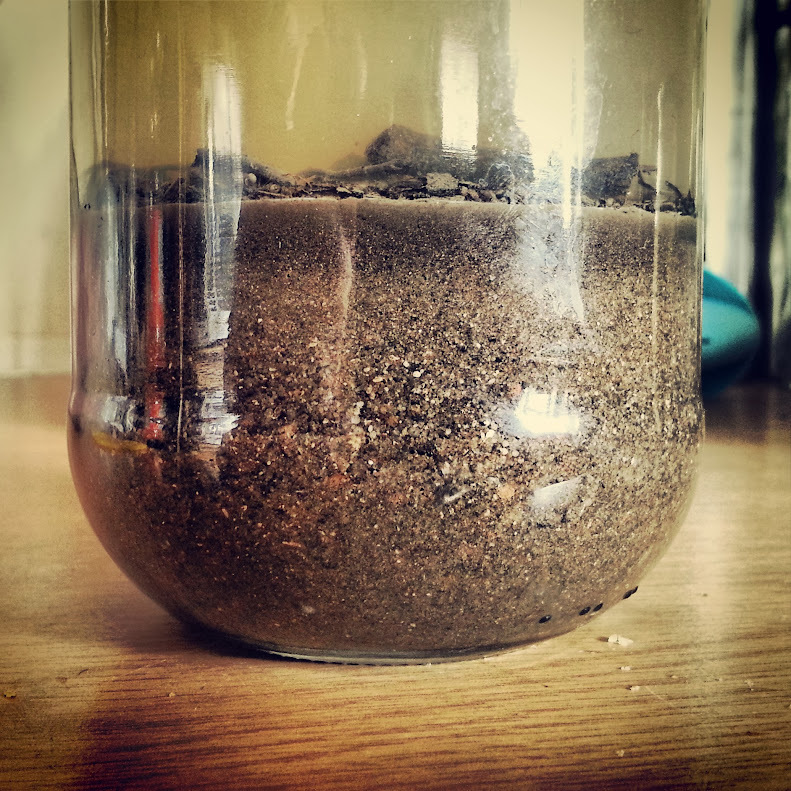 SOIL TEST: Oh dear, supposedly a good mix is 40/40/20 of sand/loam/clay. This looks more like 90/8/2 to me. Will have to amend with a LOT of compost and organic material, and even then, probably water more frequently than "once a week". Digging out all the soil up to about 2 feet deep, sieving all the broken glass, stones, bones, charred sticks, plastic out, mixing with compost and putting back. The cinderblocks at the back are to stop our dachshund from digging under the fence into the neighbour's yard. I garden so that I don't kill people. Very nice! Good work! It must make you feel good to see it looking like that now. Tell us what all is in it. I see a bunch of chard and maybe some sorrel? A tomato in a container at the back and some chives. What is growing in the paver cracks? Maybe thyme or oregano??? it is pretty how you planted that. Potager isn't a term in real common use over here. I think it implies a kitchen garden that is designed for beauty as well as edibility, usually with flowers mixed in, like your marigolds. You made a good example. Is the high solid wall behind it not a problem? What direction does your garden face? It turned out beautiful! I am so happy for you- it is always great when hard work is rewarded with great results. I love the look of the supports and the plant arrangements. Simply wonderful- great job! 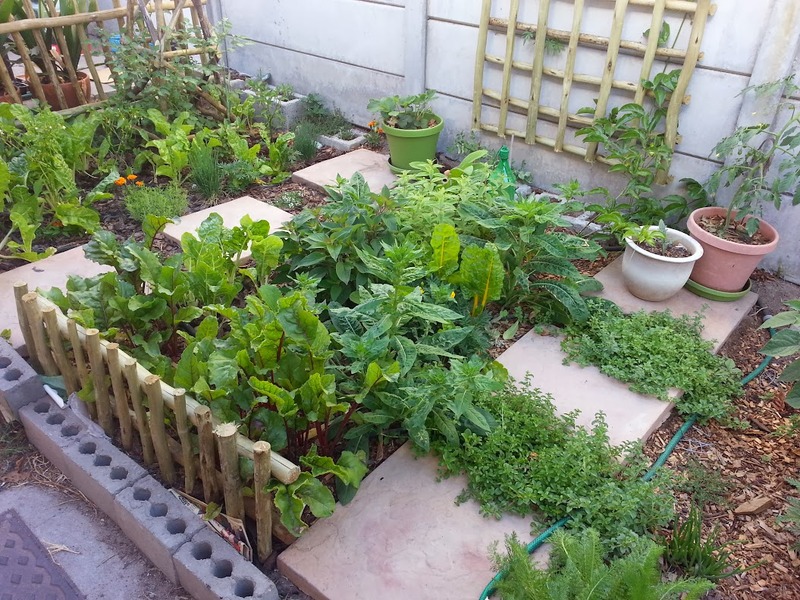 I definitely had a kitchen/cottage garden in mind, with (edible) flowers as well as herbs and vegetables. I sort of started with a plan, but then it kind of devolved into "well, I have this plant available now and they need to be potted up or transplanted urgently, so let me plant it now". 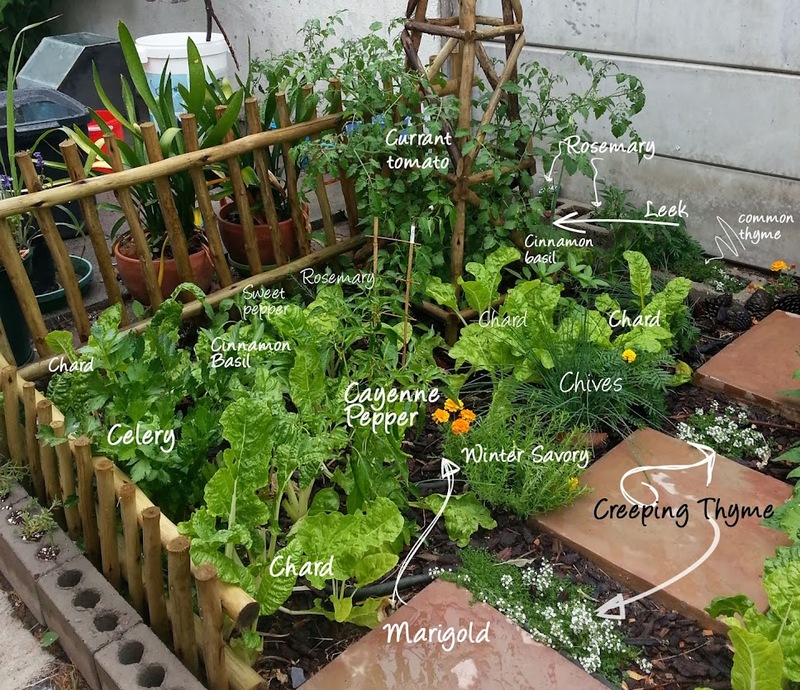 My goal for this section was to plant things which are either really expensive (eg, mange tout, snap peas, baby veg of any kind), or things that supermarkets always sell too much of and you can never finish before it goes off (eg, coriander, swiss chard, etc), or things that are hard to find (eg, chinese vegetables of any description). I'm not going to bother with things that are "cheap as chips" - like onions, carrots or potatoes. Swiss chard, canary yellow swiss chard, cayenne peppers, celery (grown from the stub of a store-bought bunch), chives, cinnamon basil, a sweet pepper (odd though - these are supposed to be annual, but this plant is going on 3 years now? ), marigolds (lemon drop and tangerine) here and there because they were going spare and they make good companions to just about anything, winter savoury. 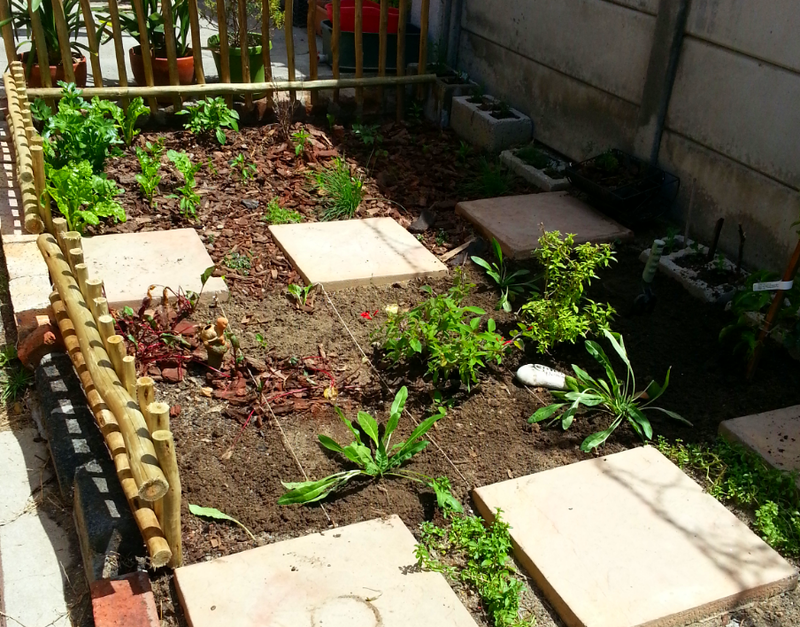 At the very back, planted in the cinderblocks in this strip: rosemary, common thyme, creeping thyme, another marigold, and a petunia that isn't terribly happy. The side closest to the wall gets a bit less sun though, so the swiss chard and chilis that I've planted there are quite small, and have yet to reach a harvestable stage. 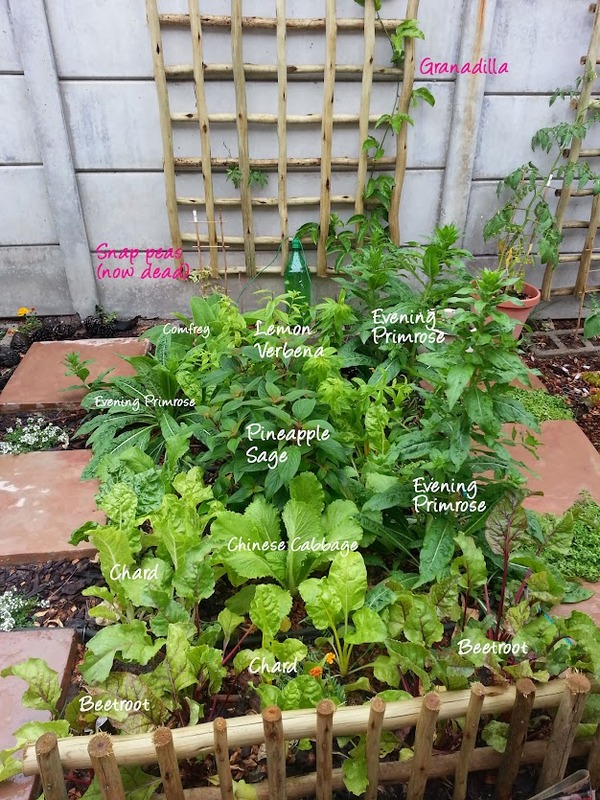 In contrast, the chard on the wood fence side, from the same seedling tray, has given me almost 1 kg of chard already. Just goes to show what the right position can do! 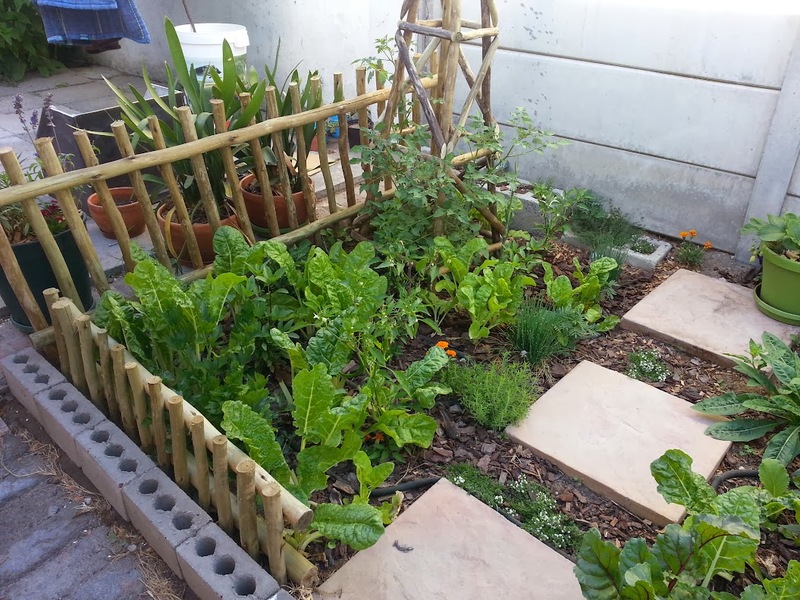 I might have to pull that chard up and plant something that tolerates a bit of shade there instead - maybe lettuce or something. The tomato growing up the teepee thingie (this was a volunteer tomato I found growing in the cracks of our patio. I dug it up and replanted it here, and its going nuts in this section. Looks like it will be some variety of cherry tomato - lurve cherry tomatoes!) I can never remember though if you are supposed to prune the suckers off only indeterminate tomatoes, or both determinate and indeterminate. Doesn't really matter though, since I have no idea what this one is. Between the pavers on the far left is creeping thyme, the middle strip has pennyroyal and the far right strip of pavers has creeping oreganum. The green pot has strawberries in it (not sure which kind though - they were a gift from someone). Another volunteer tomato in the terracotta coloured pot. Probably a beefsteak tomato? An artichoke in the plant in front of that - I know they get huge. Its just there as a temporary refuge from the dogs (had to dig them up and make a new plan for them - dogs kept trampling the seedlings). This patch isn't well represented in the photos, but is my "this needs less watering" patch. Common sage, variegated sage, golden sage, yarrow, rosemary, bulbinella, African wormwood, lemon thyme, marjoram and a large gooseberry bush. 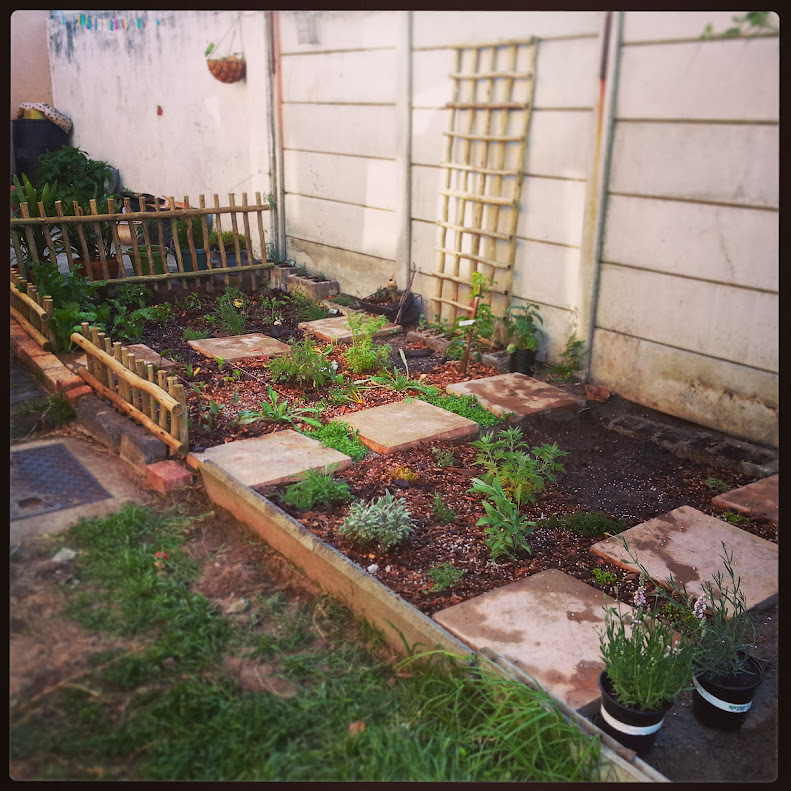 This is the "mostly pretty" strip - lemon tree, 6 different kinds of dwarf lavender, some dianthus, more marigolds, fennel, wild garlic, and 3 zucchini plants, which I'm kind of regretting putting here because they are getting much bigger than I realised they would get, and are sort of crowding out the rest. 1. Most plants move away from concrete walls because it is too hot and there is no light for part of the day because of the shadows cast by the walls. The only exceptions were vandas, night blooming cereus, and creeping fig that will attach themselves and don't mind the hot wall. 2. I made my bed three feet wide and I still had to get inside it since I could not reach all the way into the back and I had to climb over the taller sideways growing plants in the front. 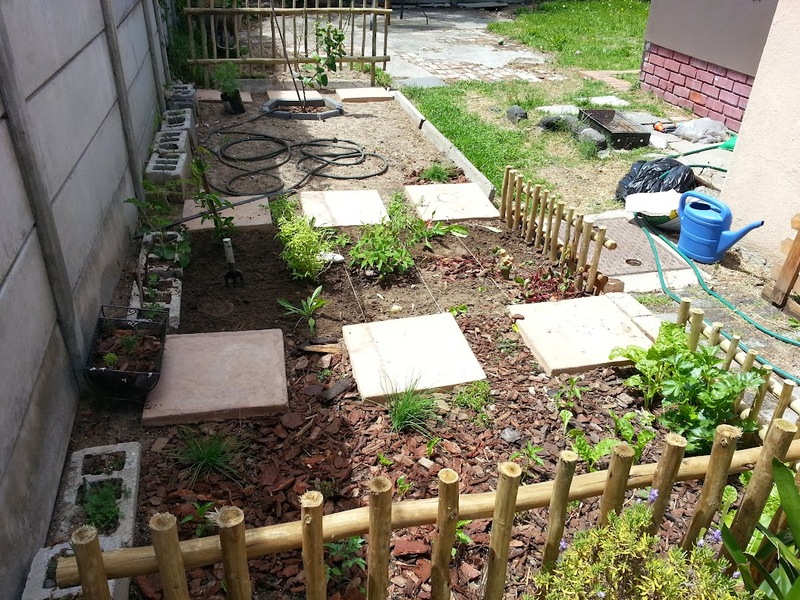 Now, I just have potted citrus , roses (a wild rambler and a landscape rose) in there and some orchids on the the concrete blocks that formed the raised bed. Plus a whole lot more pots that have grown in front of it. It would have been better if I had moved the bed out further and left a maintenance path in the back of the bed between the wall and the bed. That way I could have made the bed four feet wide and still be able to reach in from all sides without having to get into the bed itself and it would have given the plants in the back a more light since it would take a little longer for the wall's shadow to shade the bed. My bed was facing east. 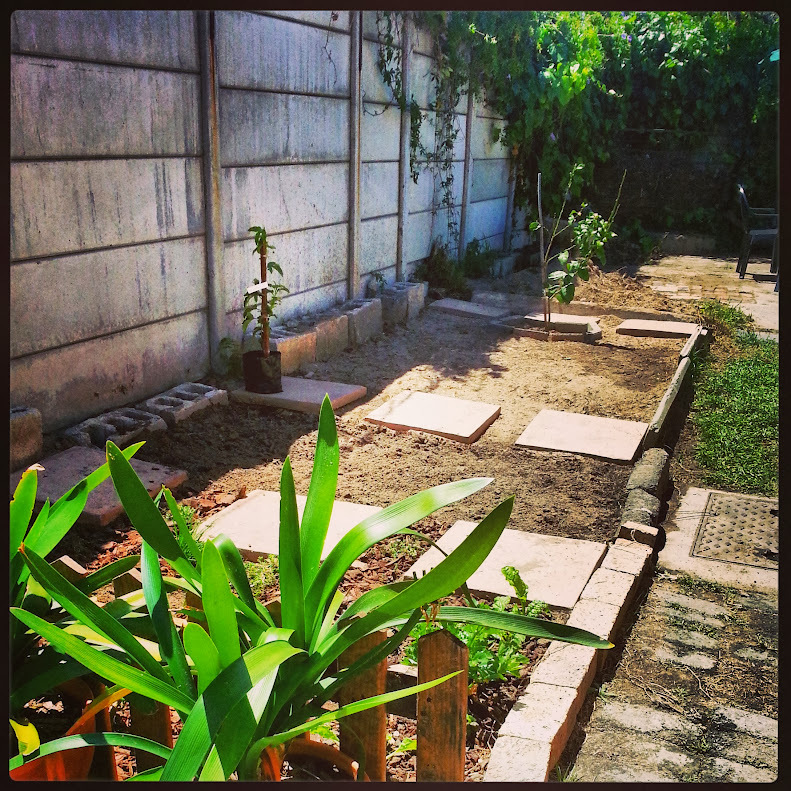 I moved my vegetable bed to where there once was a mango tree (I found part of the stump when I was digging in it) and had since been turned into a rock garden which had been derelict from 10 years of tenants living there before we bought the house. It is raised up about 10 inches and except for the fact that it interfered with the swale, it gets full sun for most of the day. It is roughly an oval 8ftx16 ft so I still need to walk in it but it worked better than up against the wall. Wow, imafan26, sounds like a lot of work? Lovely! Looks beautiful and tasty! Very nice! Your photos make me eager for spring! In fact, the dogs have dug up the marigolds and petunias I planted in the cinderblocks at the back They didn't get to the thyme, but the flowers obviously offended them. 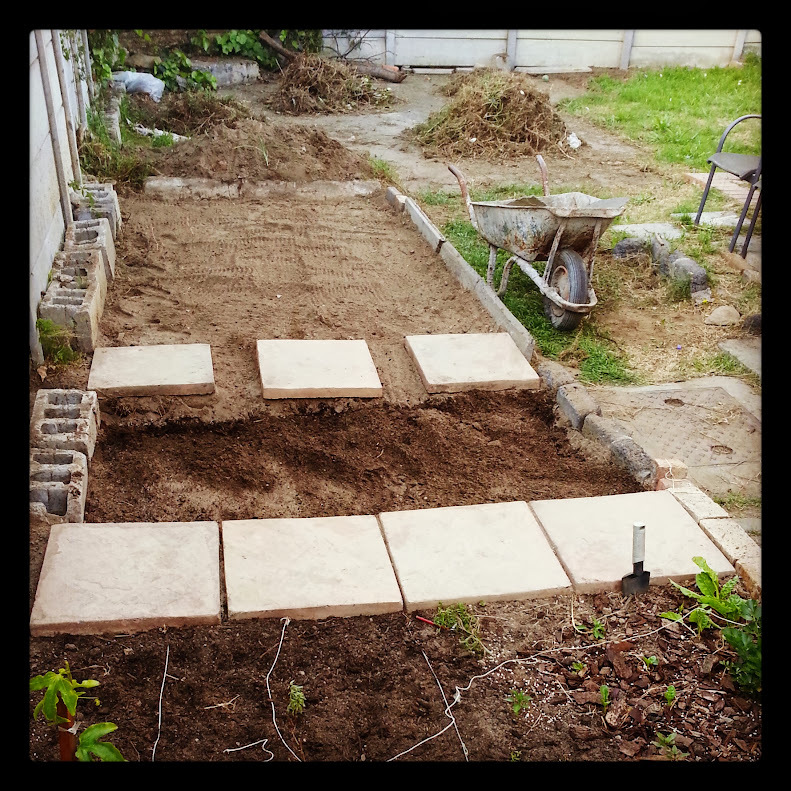 What if you put another row of cinderblocks down -- leveled -- then put flagstones on top as a path? 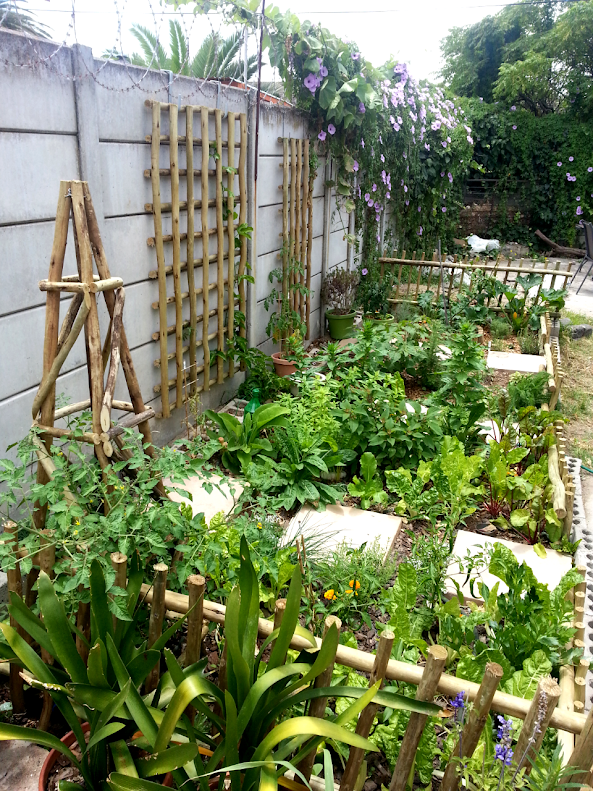 IF you are able to create a long bed that you can use from wall side as well as interior side, then the loss of garden space might be compensated by removing the large square stepping access? ...not something you want to do now while the garden is looking so lovely, but maybe for future plans. I don't really mind though, as long as my fur babies are happy, and anyway I have plenty of "spares" of anything they dig up in their desperate attempts to catch a kitty. The evening primrose is growing much bigger than I realised - I might dig up the one on the left and see if it transplants well to another section of the garden (perhaps my side alley mentioned in another post). And the lemon verbena and pineapple sage just luuuurve this spot, so when the annuals (chinese cabbage, etc) are harvested, I won't replant those spots, just leave them open for the verbena and sage to spread.